911B Mini-Size TT Table. Package includes TT Table, TT Ball (03 no's), TT Bat (02 no's), TT Net and Net Stand and User Manual. 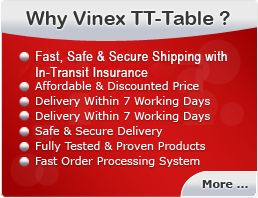 Package includes TT Table, TT Ball (03 no's), TT Bat (02 no's), TT Net and Net Stand and User Manual.